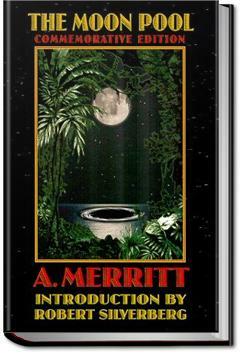 Dr. David Throckmartin’s scientific expedition to the South Sea Islands discovers among ancient ruins a portal into Muria, an unknown underground world. After the disappearance of Throckmartin, his wife and two companions, his old friend Dr. Walter Goodwin enters Muria with a rescue party, only to confront an fantastic world filled with incredible beings, astounding scientific advances, and the worship of the most evil of all creatures, The Dweller. . . .I watched him go. Superstitious. I, whose pride was my scientific devotion to fact and fact alone! Superstitious—and this from a man who believed in banshees and ghostly harpers and Irish wood nymphs and no doubt in leprechauns and all their tribe! Half laughing, half irritated, and wholly happy in even the part promise of Larry O'Keefe's comradeship on my venture, I arranged a couple of pillows, stretched myself out on two chairs and took up my vigil beside Olaf Huldricksson. Admission #1: I picked this up off the shelf because it has the word "moon" in it. Yes, that's right. I have some hippie in me, somewhere beneath all the grunge and macaroni and cheese. I'm all about the moon. 4.5 stars. Great early SF story with beautiful, evocative writing and a great story. Reads like a classic.